Today’s culture doesn’t encourage men to grow up. Everyone from pastors to op-ed columnists have described a crisis of masculinity, fostered by a media culture that uniformly make men the butts of jokes. Men are much more likely to give up on life than women. One indicator of this is the large gender difference in suicide rates—men are four times more likely than women to drop out of life. This points to a profound lack of effective mentoring of men, especially in the church. Dave Bruskas seeks to fill in this gap with this book. Two decades ago, Dave lost his only infant son to a congenital heart defect. That devastating loss fueled his desire to provide effective mentoring to young men. Dear Son contains the guidance and insights Dave would have given his son if he had lived through the milestones of growing up: from first dates to first jobs, from weddings to births, from friendships to funerals. 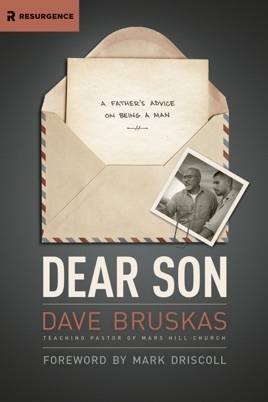 Dear Son contains heartfelt wisdom for life’s journey, especially for guys—and for those who want to strengthen them.